New research challenges the controversial theory that an ancient comet impact devastated the Clovis people, one of the earliest known cultures to inhabit North America. Writing in the October issue of Current Anthropology, archaeologists Vance Holliday (University of Arizona) and David Meltzer (Southern Methodist University) argue that there is nothing in the archaeological record to suggest an abrupt collapse of Clovis populations. "Whether or not the proposed extraterrestrial impact occurred is a matter for empirical testing in the geological record," the researchers write. "Insofar as concerns the archaeological record, an extraterrestrial impact is an unnecessary solution for an archaeological problem that does not exist." The comet theory first emerged in 2007 when a team of scientists announced evidence of a large extraterrestrial impact that occurred about 12,900 years ago. The impact was said to have caused a sudden cooling of the North American climate, killing off mammoths and other megafauna. It could also explain the apparent disappearance of the Clovis people, whose characteristic spear points vanish from the archaeological record shortly after the supposed impact. As evidence for the rapid Clovis depopulation, comet theorists point out that very few Clovis archaeological sites show evidence of human occupation after the Clovis. 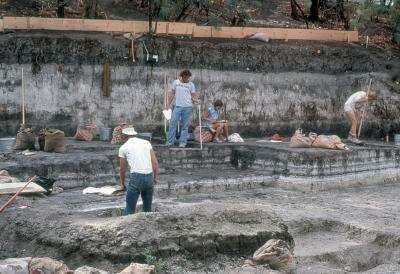 At the few sites that do, Clovis and post-Clovis artifacts are separated by archaeologically sterile layers of sediments, indicating a time gap between the civilizations. In fact, comet theorists argue, there seems to be a dead zone in the human archaeological record in North America beginning with the comet impact and lasting about 500 years. But Holliday and Meltzer dispute those claims. They argue that a lack of later human occupation at Clovis sites is no reason to assume a population collapse. "Single-occupation Paleoindian sites—Clovis or post-Clovis—are the norm," Holliday said. That's because many Paleoindian sites are hunting kill sites, and it would be highly unlikely for kills to be made repeatedly in the exact same spot. "So there is nothing surprising about a Clovis occupation with no other Paleoindian zone above it, and it is no reason to infer a disaster," Holliday said. In addition, Holliday and Meltzer compiled radiocarbon dates of 44 archaeological sites from across the U.S. and found no evidence of a post-comet gap. "Chronological gaps appear in the sequence only if one ignores standard deviations (a statistically inappropriate procedure), and doing so creates gaps not just around [12,900 years ago] but also at many later points in time," they write. Sterile layers separating occupation zones at some sites are easily explained by shifting settlement patterns and local geological processes, the researchers say. The separation should not be taken as evidence of an actual time gap between Clovis and post-Clovis cultures. Holliday and Meltzer believe that the disappearance of Clovis spear points is more likely the result of a cultural choice rather than a population collapse. "There is no compelling data to indicate that North American Paleoindians had to cope with or were affected by a catastrophe, extraterrestrial or otherwise, in the terminal Pleistocene," they conclude.